I dub this look, "Safari Barbie." Because really, what else could it be? (Suggestions welcome.) These are my new BC sandals, on the inside they say "Because I take the road less travelled." 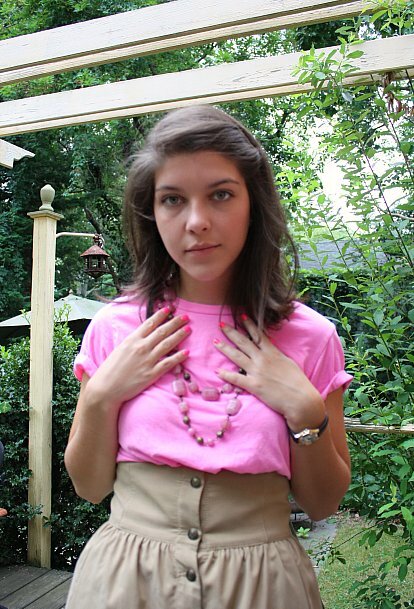 Here I am trying to look calm and pretty (and very style blogger-ish) while showing off my necklace. 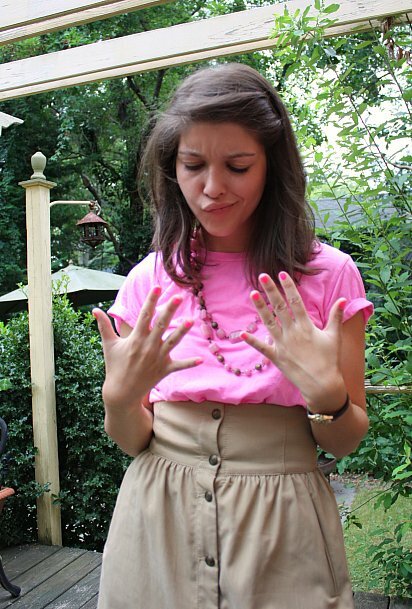 I then realized that my nail polish matches my shirt almost exactly. This is how I feel about my matchy-matchy. I'll leave the interpretation to you, my dear readers. Haha I love the last two pictures! Cutie. That skirt absolutely rules; the super high waist is great. And I think Safari Barbie is a perfect way to describe this. XD I love it! Safari Barbie: ha ha ha! GREAT name for the look. It could also be "Palm Sprints Khaki." 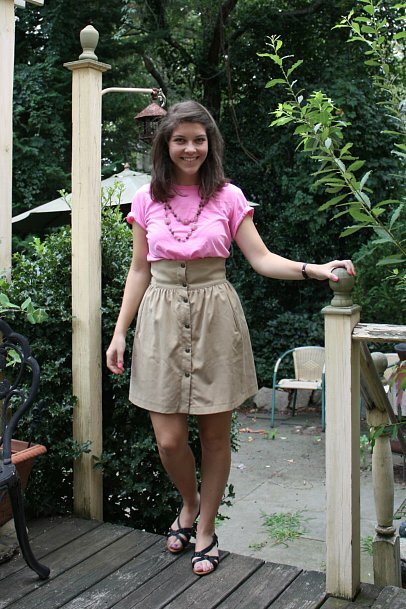 You look great, cool as a cucumber in your pink and tan. Like the blogger pose by the way. Yeah, it's tough to come up with new poses and not feel silly. Hehe I could have sworn my safari barbie had the same outfit! Haha, I love your face in the last photo - too adorable! Also, that's how I feel when I'm too matchy matchy as well. Thanks for your sweet comment! The nailpolish fits perfectly :D And...I adore your shoes in your last post! i love your skirt. so summery. hahaha so funny, what subway did u think you saw me on? what day? ahh oh my god I had a doll when I was little that was like a rip-off of barbie, and the first one I got was a Safari one! I remember each doll came with a magazine and it had all safari-themed stories and puzzles and stuff. then your pink top reminded me that there was a ballerina one too! oh I loved that doll, why can't I remember her name? that's gonna bug me now. well this was the most pointless comment ever. I like your sandals. check out my latest giveaway! You look so pretty. I love that tee colour, it's so pretty and of course awesome nail polish. I love hot pink!! Totally a Safari Barbie look. ooh pretty! My first thought was "pink desert" but i prefer safari barbie. What is the name of the essie polish? I want something really pink on my nails! lol I love this look, I always forget about nails :P That skirt rocks!